The Saint-Lawrence Wetlands Mapping Project is a multi-year project that mapped portions of shores of the St-Lawrence river. 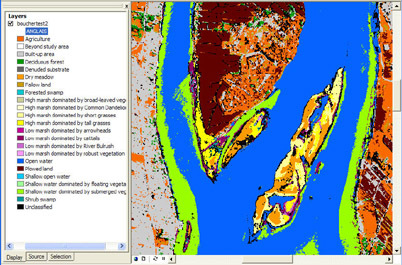 The 64 landuse categories, including wetland classes were mapped using remote-sensed imagery from 1990/1991, 1996/97, 2000, and 2002. The data and associated reports are published by Environment Canada's Saint-Lawrence Centre. Author and Publisher Saint Lawrence Centre. Environment Canada. Map Index Please consult these index to the maps before ordering the data. Please note that the geographical coverage varies with each year. Documentation Documentation is provided when the data is requested. Included is the landuse classification system and the official report that accompanies the data. Please note that report is available in French for all four dates, but only available in English for the 1990/1991 data. Access Members of the McGill Community can obtain copies of the data by filling out the Geospatial Data Request Form. Please provide the map tile name, year, and format (eg. Chateauguay 1991 Shapefile format). Citation Example Saint Lawrence Wetland Maps 1990-1991. [computer file]. Montreal: Centre Saint-Laurent, Environment Canada, 1991.